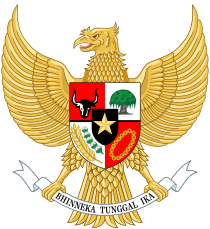 The Garuda Pancasila is the coat o airms o Indonesie. The main pairt o the coat o airms is the Garuda wi a shield on its chest an a scroll gripped bi its leg. The shield's five emblems represent Pancasila, the five principles o Indonesie's naitional philosophy. Garuda Pancasila wis designed bi Sultan Hamid II frae Pontianak, an wis adoptit as naitional coat o airms on 11 Februar 1950. Statue of Keeng Airlangga depicted as Vishnu mounting Garuda. Balinese widden statue of Garuda battling Naga serpent, Indonesia Museum, Jakarta. Garuda, the vehicle (vahana) of Vishnu appears in mony temples of auncient Indonesia. Temples sic as Prambanan, Penataran, Belahan, an Sukuh depict the images (bas-relief or statue) of Garuda. In Prambanan temple complex thare is a single temple locatit in front of Vishnu temple, dedicated tae Garuda. Houiver thare is no statue of Garuda inside the chamber the day. In the Shiva temple, an aa in Prambanan complex, thare is a relief telling an episode of Ramayana aboot Garuda Jatayu tried tae rescue Sita frae Ravana's haund. The deified statue of Keeng Airlangga depicted as Vishnu mounting Garuda frae Belahan, probably the maist famous statue of Garuda frae auncient Java. Nou the statue is ane o the important collection of Trowulan Museum. Garuda appear in mony tradeetions an stories, especially in Java an Bali. In mony stories Garuda symbolizes the virtue of knowledge, power, bravery, loyalty, an discipline. As the vehicle of Vishnu, Garuda an aa bears the attributes of Vishnu, which seembolise preservation of cosmic order. Balinese tradeetion venerated Garuda as "the lord of all creatures that can fly", an "the majestic king of birds". In Bali, Garuda tradeetionally portrayed as a divine creature wi heid, beak, wings, an claw of an eagle, while haes the body o a human. Uisually portrayed in intricate cairvin wi golden an vivid colors, as the vehicle of Vishnu or in battle scene against Naga (draigon) serpents. The important an noble poseetion of Garuda in Indonesian tradeetion syne auncient times haes venerated Garuda as the naitional seembol of Indonesia, the embodiment of Indonesian ideology, Pancasila. Garuda an aa chosen as the name of Indonesian naitional airlines, Garuda Indonesia. Next tae Indonesia, Thailand an aa uses the Garuda as its naitional seembol. Wikimedia Commons haes media relatit tae Coats of arms of Indonesia.